Published in the Dover Express, 15 August, 1980. The Fortress of Dover comprises the Castle and the Western Heights, with the outlying fortifications of both. The Castle, apart from its value as a place of arms, opens up a rich field of antiquarian and historical study. The same remark, in a lesser degree, applies to the Western Heights, while the fortifications of both require separate treatment. The history of Dover Castle has been the theme of many writers, but there have been many important transactions thereat of which we have no particulars, and of the grand panorama of events associated with the ancient fortress, one-half has never been told. In this brief sketch, it will only be possible to outline the periodic activities in the building of the Castle, and to touch upon the more important incidents in its annals. The Britons, who were adept in the arts of war before the Roman invasion, must have used the Castle Hill as a stronghold; in fact, they occupied it in arms when Julius Caesar, B.C. 55, attempted to land. A reference in Darell’s History of Dover Castle, to a subterranean defence work left by the Romans has given rise to conjecture that the first defensive works on the hill were not in the form of buildings but earthworks. The casemates in the face of the castle cliff, which were adapted for the accommodation of troops in the middle part of the 18th century, may have been a development of ancient caves and dene holes, which the aboriginals were accustomed to dig for safety; and it is highly probable that the use that the ancient Britons made of the Castle Hill was to dig caves in the surface, from which there were openings in the cliff seaward, both for the purposes of light and air, and also to afford a vantage ground, from which an enemy could be observed, and attacked. If, as Darell states, there was, in ancient times, a subterranean castle, it is much more likely that it was the work of the ancient Britons than the Romans. The first buildings raised on the Castle Hill are attributed to the Romans. The date of their erection is uncertain. Tradition states that Julius Caesar, after his second expedition, B.C. 54, took possession of this hill, building fortifications thereon, to protect the haven, which was then the only place in Kent where the sea penetrated between the hills. This conjecture is reasonable, because, after Caesar had broken down the opposition of the Britons, on Barham Downs, there was nothing to prevent his occupying, with his ships of war and transports, the haven between the Dover hills, which it was his first intention to utilise. There is historical authority for the statement that, in the reign of Claudius Caesar, about the year A.D. 49, Aulus Plautius, a Roman officer of Consular rank, built forts to overawe the refractory Britons, and the Pharos and other Roman works, of which there are still remains on the Castle Hill, were built by him at that period. The chief Roman fortification was an oval-shaped plateau, measuring 400ft. from north to south and 140ft. from east to west Around this was dug a deep ditch, the chalk from which was thrown up to form a rampart. Across the southern end of this oval were built, at a later date, two towers. The western structure, to which the greater antiquity is attached, is known as the Roman Pharos. The foundations of this tower are laid in strong clay, and experts state that the materials of the structure are Roman tiles, Roman mortar, and tufa. Of the latter there were substantial beds available in the valley of the Dour; but there was no building stone on the spot. The foundations of a similar tower, presumably built at the same period, were found on the Western Heights. It is supposed that both these towers were raised to support beacon fires, to guide mariners in entering Dover haven. On the eastern side of the oval plateau, in the Castle, was built another tower, to be used as a specula or lookout. This tower is said to form the central portion of the church of St Mary-in-the-Castle, it being supposed that the chancel, nave and transepts were added, some centuries later, to transform the watch tower into a Christian church. 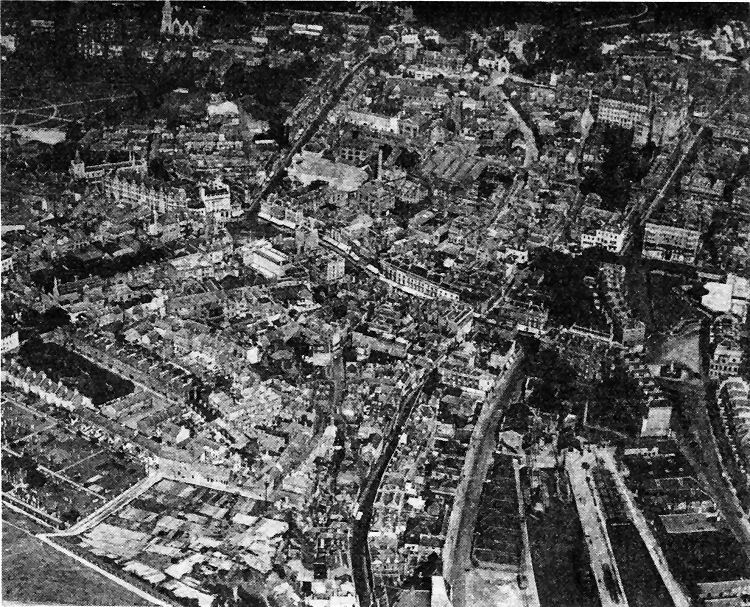 Viewed from the air above Snargate Street and Wellington Dock this was probably the busiest part of Dover when this photograph was taken in the 1910s. On the left is the heavily populated Cowgate Hill area and In the centre foreground is the roof of the old Hippodrome theatre, which ran through from Snargate Street to Northampton Street. Other Interesting landmarks, now disappeared, Include the New St James’ Church, top left, Phoenix Brewery, off the Market Square, the Town Mill, off Town wall Street, In the centre and, on the right, the Burlington Hotel and the Grand Hotel and the Granville Gardens pavilion and restaurant. 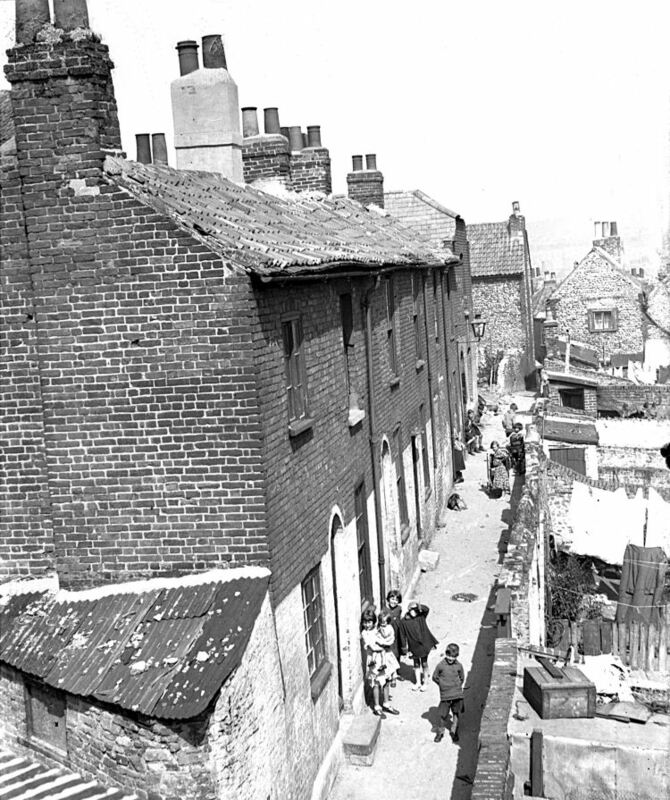 Below Is Blucher Row pictured 17 August 1934 before the properties along with many more In the Durham Hill area were demolished as part of a slum clearance programme. Some of the Durham Hill council fiats now stand on the site.